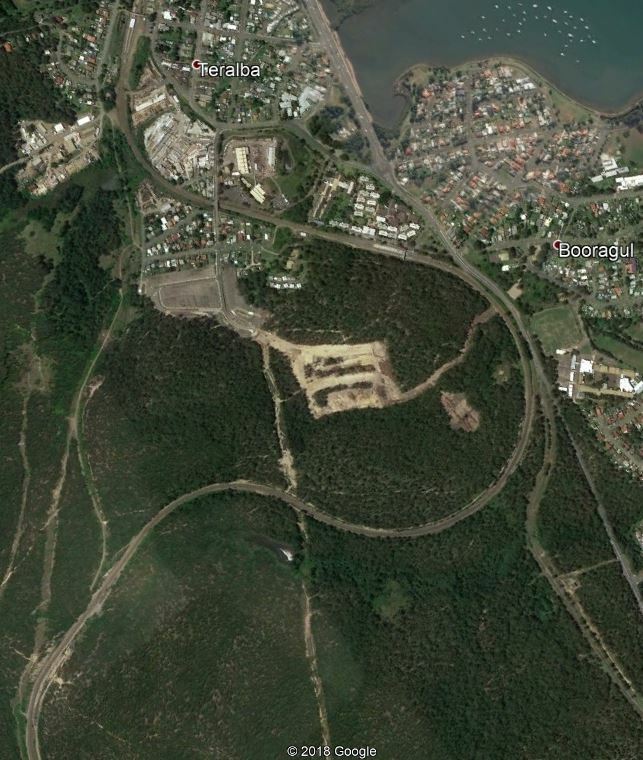 While looking at Google Earth this weekend I noticed that it was somewhat odd the way the Sydney-Newcastle train line has a big eastward loop just south of Teralba. Why didn’t the train line just continue north-south in a relatively straight line? 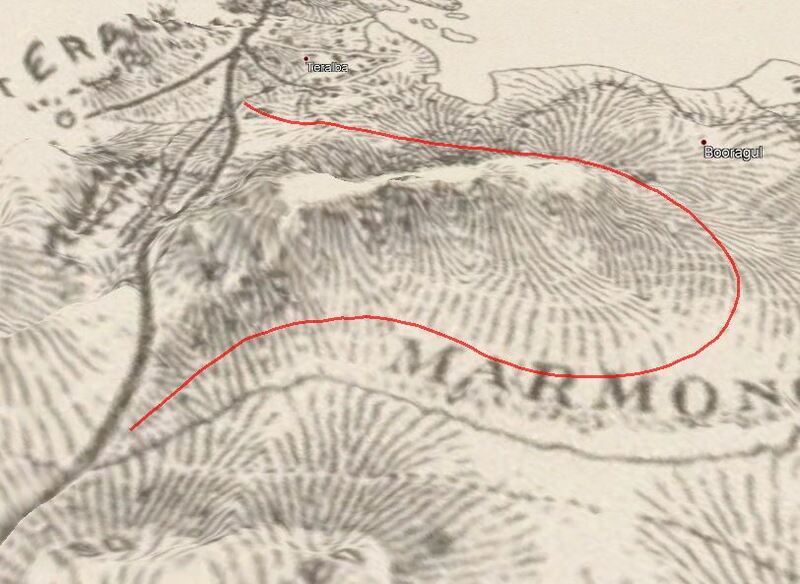 Consulting Parrott’s 1893 map revealed that’s exactly what the line used to do. Here’s the map overlaid onto Google Earth, with the present day path of the rail line shown in red. So why the change, and when did it happen? The grade will be 1 in 80 as against 1 in 40 and 1 in 50 on the present line. It is estimated that this deviation of the line, though a costly matter, involving as it does the expenditure of some thing between £70,000 and £80,000, will enable one engine to do work which it now takes two to do, and thus the expenditure is believed to be justifiable. Construction of the Teralba deviation was halted in October 1901 because of a legal dispute. The deviation passed over the workings of the Pacific Co-operative Steam Coal Company, and the Railway Commissioner’s had offered £2,000 in compensation for the resumed land. The coal company thought this too little, and put in a counter claim for £25,000 compensation. Construction of the deviation recommenced in early 1902 while the legal arguments about compensation continued. In June 1902 it was reported that “the Teralba section is being pushed forward rapidly, giving employment to from 300 to 400 men”. The construction was reported as completed in April 1903. After a lengthy court case in March 1903, the jury awarded the coal company £17,609 in damages. On 11 June 1903 the coal company signed a “judgement for the amount of the verdict, with interests and costs.” But two months later in August 1903 the matter was back in the courts, where a ruling was made that the coal company “were not entitled to recover such costs.” To make matters even more complicated (as if they weren’t complicated enough), the Pacific Co-operative Steam Coal Company didn’t own the land they were mining. They leased it from the Perpetual Trustee Company for an annual fee based on the amount of coal extracted. The Perpetual Trustee Company thought that their payments would be reduced due to the resumption of land by the railway, and therefore they launched separate legal action against the Railway Commissioners for payment of compensation. Convoluted legal proceedings continued for years, going all the way to the Privy Council in London in September 1904, other proceedings to the High Court of Australia in September 1905, and continuing in other courts until at least May 1906. With the massive amount of time spent in the courts and associated legal fees, I suspect the 3km Teralba deviation became the most expense piece of railway construction in NSW at the time. This entry was posted in Local History, Maps, Teralba (2284) by Lachlan Wetherall. Bookmark the permalink.